This week in the Scottish Parliament, MSPs voted for the repeal of the 2012 Offensive Behaviour at Football Act. This law was introduced by the SNP Government against strong opposition, and now that the SNP is a minority government this is the first serious attempt, led by Labour, to reverse the Act. The OBFA, as it’s more snappily known, is widely considered to be a poor piece of legislation. The goal was to crack down on sectarian and violent behaviour at football games, which reached a peak in an infamous Scottish Cup tie between Celtic and Rangers in 2011. But with the Act being more broadly criminalising on issues such as political expression it has affected some genuine and entirely inoffensive attempts by football fans to assert their collective identities in a positive way. On the whole, while the aim of the Act was good, the execution was poor – and has led to the wrong people being targeted and the police being powerless to affect real change against the sectarian songs and chants that are heard up and down the country when Celtic and Rangers play. There was a clear example of this today in Dingwall, Rangers beat Ross County 2-1 – and despite the flurry of new signings and the general positivity that Rangers could have about their performances on the park, the majority of their chants were still of a sectarian nature. They sang more songs about the Pope and the IRA than they did any of their players or their manager. So while the OBFA is a slapdash piece of legislation that doesn’t address the root problems we see in society and at football games, to scrap it completely and leave nothing to specifically target a scourge of Scottish society is just as much of a mistake. Sectarianism would not exist in modern Scotland without Celtic and Rangers. The issues that historically drove the wedge between Protestant and Catholic communities in this country no longer exist in everyday life, apart from in the minds of a deluded section of these clubs’ supporters. For years there have been half-hearted efforts by footballing and police authorities to combat this, with the OBFA being the tip of the iceberg, but nothing has remotely come close to punishing the poisonous behaviour that we see week-in and week-out. The clubs, the SFA and the police are all aware of the sorts of chants that were heard today. With Celtic and Rangers games being almost always televised, there is clear evidence of these chants being sung – with broadcasters often turning the volume down to drown them out. But even though these are clear violations of policy, there is nothing done about it. The only real solution here is one that impacts both the fans and the clubs that harbour and passively tolerate this behaviour. 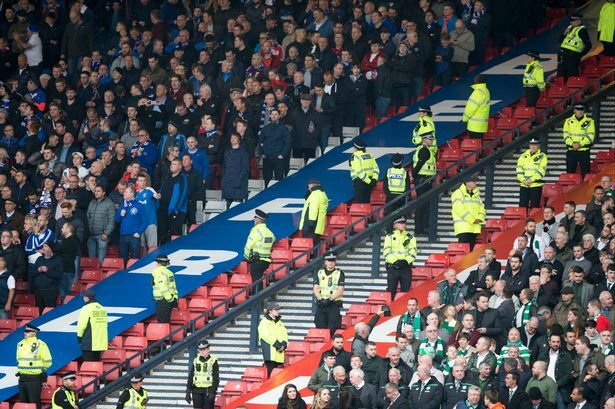 Stopping a game in play if sectarian chants are sung could be one option referees or police at a game could take. Stern fines of £100k or more, and teams being ordered to play behind closed doors would be a fitting punishment to take effect after a game – those are the sorts of things that need to be done. The simple truth is that these actions are the only thing will force clubs to take action, and only then will we really be able to change the behaviour of those on the terraces. At games like the one today, there are plenty of young supporters getting their first glimpses of big football games – and experiences they’ll remember forever. When these experiences are tainted by the sorts of offensive chanting we hear from the Old Firm, this helps reinforce to another generation that these are acceptable within football. The clubs, the football authorities and the Police are all complicit and should work with MSPs to provide a real alternative to the OBFA that is fair to supporters but creates a real framework to punish sectarianism and eradicated it from our game and our society. So while this week there have been clear signs that there is work to be done to address the failings in our legislation, there’s also been clear motivation to see it done. It’s just hopefully this time there can be a real solution rather than a sticking plaster on a national scar on our character.